There are a multitude of micro DVRs in the video security market, with each one offering unique features and specifications to set it apart from other micro recorders. This can make selecting a micro recorder for your application time consuming and frustrating. Below we will address different features and benefits of some of our popular micro recorders in order to make the selection process easier. Our most popular unit, the MDVR14 Solid State Micro DVR with Motion Detection, is used in most of our covert devices and in our popular BADGER1 unit. 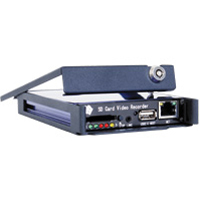 Its low cost, very low current draw and ease of use make it an ideal video recorder for covert and remote applications. High video compression gives the MDVR14 the ability to record approximately 4 hours of video per gig of storage space. However, its video compression capability is also a limitation. Since the compression rate is so high, the DVR cannot capture details of fast moving objects, such as vehicles in motion. Customers frequently ask if you can capture license plates with this unit. The answer is no. If you need to gather information about time, intent and general observation, this is a great piece of equipment. If you need more detail for identification, the MDVR14 may not be the right unit for you. 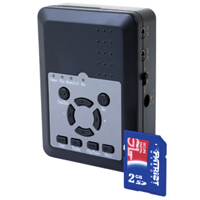 The MDVR25 is a single channel SD card-based micro DVR with similar attributes to the MDVR14. It is small, inexpensive, easy to use, and has a low current draw. It, however, uses a very low compression rate, giving it outstanding video quality (640x480 resolution at 30 fps). The trade-off is that the unit records approximately 1 hour of video per gigabyte of storage. The MDVR25 accepts SD cards up to 32GB, and so it isn’t difficult to quickly fill these cards. This micro video recorder is perfect for short duration operations that require high video quality and high detail recognition. Current draw is a major factor with multi-camera micro video recorders. It is very important to keep this in mind when selecting the correct MDVR for your multi-camera applications. Consider the DVRM6 when you need a micro video recorder for bait car or for field applications with multiple cameras. This 4 channel hard drive-based DVR is similar in size to a car stereo, has an internal 250GB hard drive, and features the latest H.264 compression technology for longer record times. Since the unit has an internal hard drive, limited record time due to storage restrictions is no longer a factor. However, the unit draws approximately 1 amp of current without including the current draw of the cameras. Most car batteries have an amp hour capacity between 40 a/H and 60 a/H. This makes extended recording applications difficult. The DVRM6 is best used for applications where users need remote access, control, backup, record, play-back, and live view of their video. The MDVR21SD Advanced Solid State Mobile DVR is essentially a 4 channel version of the MDVR25. It is an SD card-based DVR with 4 inputs. The current draw is very low, which makes it perfect for long duration operations. However, much like the MDVR25, the video files are very large; around 1 hour of recorded video for each camera consumes one gigabyte of storage space when recording at maximum resolution. A 4-camera application means approximately 8 hours of video can be recorded on a 32GB card. A common misconception is that enabling motion detection on the DVR saves battery life. This is not the case. By turning motion detection on, the unit will not record until it detects motion; however, the DVR is still powered on. You will save memory storage space, but the effect on current draw is negligible. Another similar misconception is that alarm inputs save battery life. Like motion detection, alarm contact inputs merely conserve record storage space. The micro DVR still has to be powered on in order to recognize the recording inputs. It is possible to put an external timer or relay on the DVR that completely shuts the unit off. This takes the current draw down to virtually nothing. However, there is a delay from the time the recorder powers on to the time that it starts recording. For example, the RATTLER2 has an approximate 5 second delay from trigger time to actual recording.